Lada is said to be the Lycian word for 'woman'; this may explain why the Lycians (among the many gods of the Greek myth) chose to dedicate to Leto the shrine where they once worshipped Mother Earth or a similar female deity. This change occurred in most of the cities on the Asian shore of the Aegean Sea and on some of the nearby islands as a consequence of the spread of Greek civilization. Leto with Apollo, her womanish son, and Artemis, her mannish daughter, formed a triad which reminded the Lycians of their archaic religious system, where female deities prevailed. Archaeologists attributed one of the temples to Apollo and Artemis when they discovered an elegant mosaic with their symbols: Artemis' bow and Apollo's lyre. However because archaeologists often disagree, some say that the bow is another symbol of Apollo and believe that the temple was dedicated to Apollo only; they suggest the temple between this one and that to Leto was dedicated to Artemis. Letoon was located near the sea, at only three miles from Xanthos. Its population was most likely limited to the priests who performed religious ceremonies at the temples and their servants, yet Letoon had a large theatre. This is explained by the fact that periodical festivals were held in honour of Leto and her children and crowds came not only from nearby Xanthos and Patara, but from the whole region. The central part of the theatre was carved from natural bedrock, but the current building is the result of an enlargement of the IInd century AD, with two very fine archways which facilitated access of the audience. 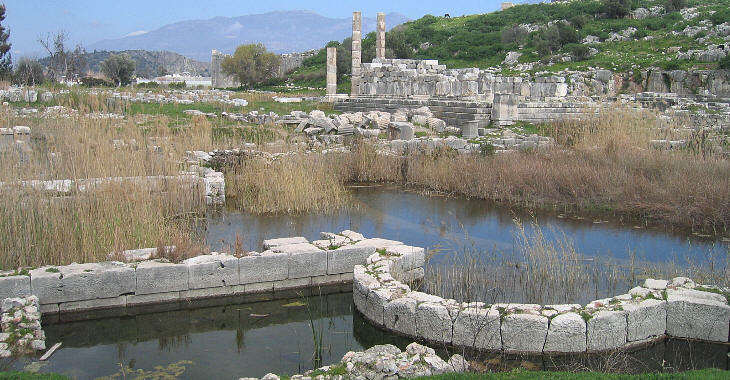 Letoon, similar to many other ancient Lycian towns by the sea, is now partially covered by marshes. This is because when the region declined there were no longer enough human and financial resources to carry on the necessary maintenance of the rivers. The decline of Lycia lasted many centuries, but three events had a special relevance to it: the first one was a plague which occurred during the reign of Emperor Marcus Aurelius. A second major pestilence occurred during the reign of Emperor Justinian; the third and final blow to the prosperity of the region occurred in the VIIth century when Arab raids forced the inhabitants to abandon most of the coastal towns. This led to the development of marshes and very unhealthy living conditions. Anyhow the nymphaeum built during the Roman rule was designed for being filled with water, although this came from an aqueduct.